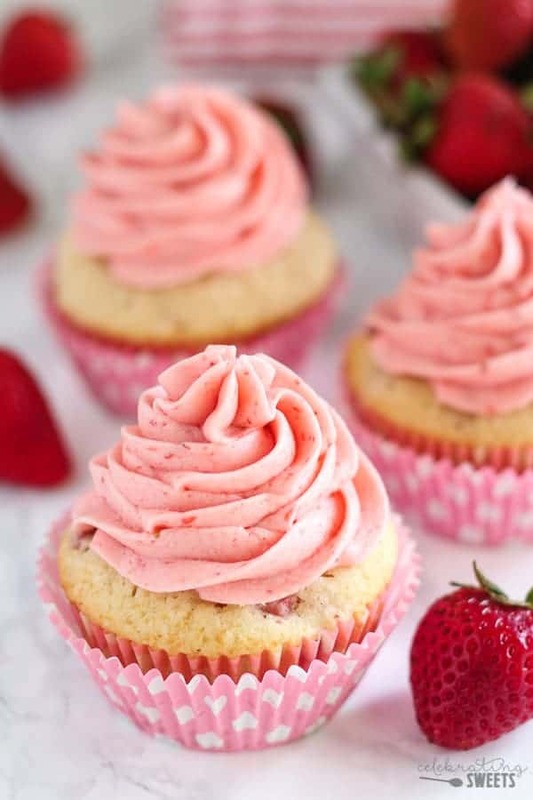 Strawberry Buttercream – An easy and beautiful pink frosting filled with fresh strawberries. Perfect on cake, cupcakes, brownies and more! Oh, hi! It’s just me, bringing you a bowl overflowing with swirly pink frosting. Wouldn’t you love to drag a spoon right through that deliciousness up there? 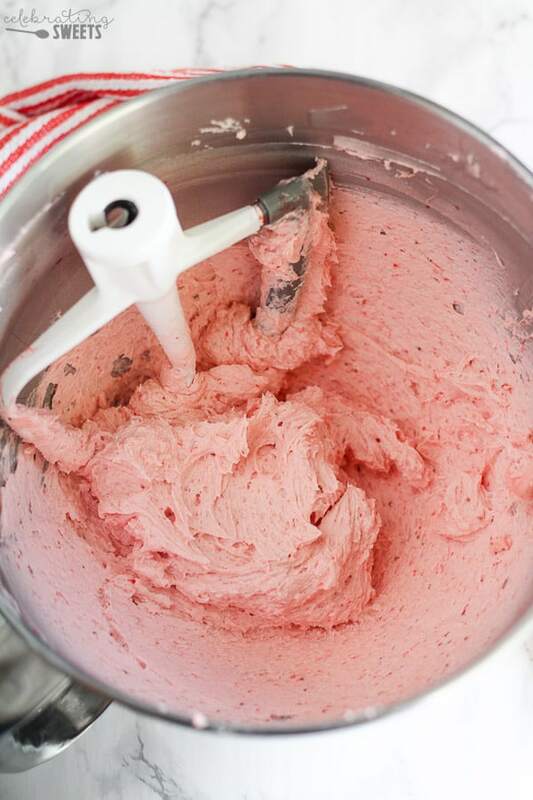 Strawberry Buttercream frosting is what spring and summer dreams are made of. Let’s put it on anything and everything. K? This Strawberry Buttercream became a regular in our dessert rotation once our daughter decided at the ripe age of 2 that she was obsessed with all things PINK! Since she has a summer birthday I have made it a tradition of always serving Strawberry Cupcakes with Strawberry Buttercream Frosting at her birthday celebrations. This is the perfect way to make a pretty pink frosting without any food coloring. Yep, you read that right – no food coloring. Real strawberries bring the beautiful pink color to our frosting. And every bite is bursting with the flavor of sweet fresh strawberries. Update: I recently started using freeze dried strawberries in order to make this frostig when strawberries are not in season. Crush freeze dried strawberries until they form a powder (I use a food processor), then sift out the seeds and add the powder into the frosting. The freeze dried strawberries add a deeper, more intense strawberry flavor, they also make the frosting a bit darker, too. If you can’t get freeze dried strawberries, you can leave them out – just make sure your fresh strawberries and sweet, ripe and juicy. 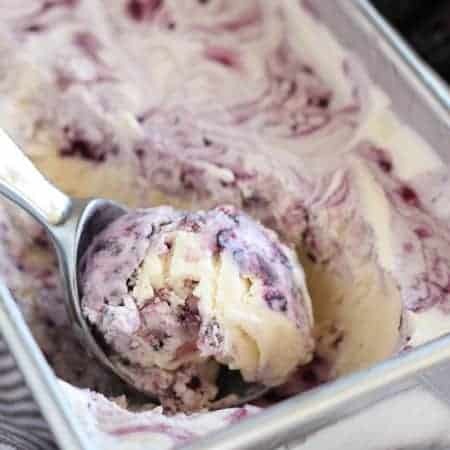 The above ingredients are combined using a hand mixer or stand mixer until smooth, creamy and fluffy. You can easily adjust the consistency by adding more strawberry puree to thin it out or more powdered sugar to thicken it up. Now to the big question… What should we put this Strawberry Buttercream Frosting on? 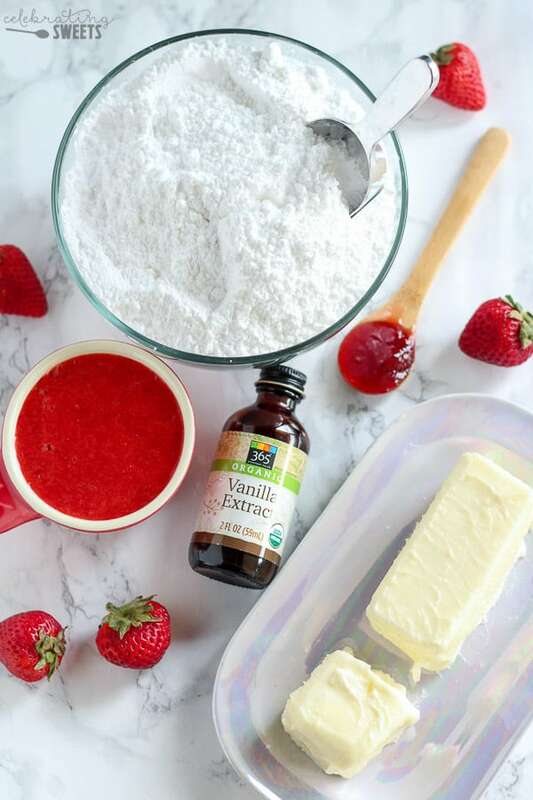 An easy recipe for buttercream frosting filled with fresh strawberries. This frosting is all natural, with no dyes or artificial coloring. It's delicious on cake, cupcakes, brownies and more! If using freeze dried strawberries: In a small food processor, blend freeze dried strawberries until they turn into powder. Pour the powder into a fine mesh sieve, discarding the solids and seeds, keeping the fine powder that came through the sieve. Measure out two tablespoons of the powder to use in the frosting. Proceed below. 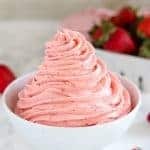 Add freeze dried strawberry powder (if using), strawberry puree, vanilla extract and jam, and beat on medium speed until fully combined, being sure to scrape down the sides of the bowl and beater as needed. If necessary, adjust the consistency by adding more powdered sugar to thicken, or more strawberry puree to thin it out. Place in a piping bag, or use an offset spatula to frost cake or cupcakes. 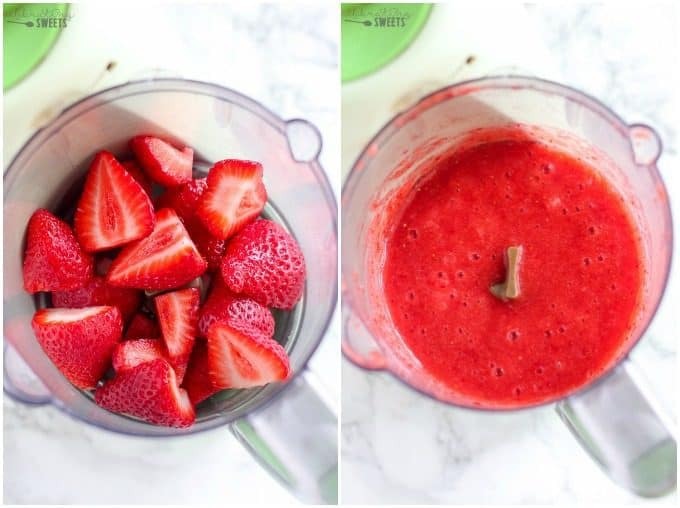 To make fresh strawberry puree: Place about 5-7 chopped strawberries into a mini food processor and blend until pureed. 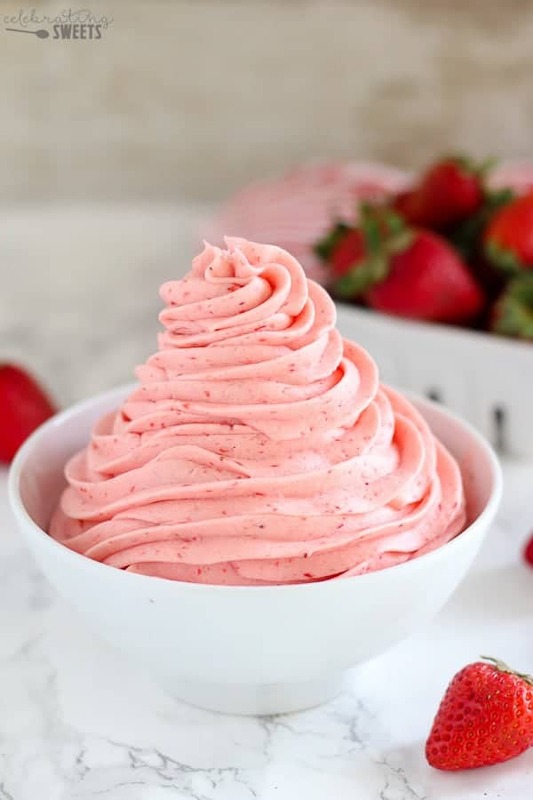 TIP: If you are also using freeze dried strawberries, blend those in the food processor first, then remove them and add the fresh strawberries. Freeze dried strawberries: Adding the freeze dried strawberries adds a deeper strawberry flavor and a darker pink color. I especially recommend using these if you are using fresh strawberries that are not super sweet, ripe and flavorful. Can I ask how long the buttercream will last please? It should last a couple of days in the fridge. Can I make it without strawberry jam, or replace it? You can, but the jam really adds a stronger strawberry flavor. If you leave it out, you can add a little extra strawberry puree. Hello! Can I prepare this and leave at room temperature for the day after? If it’s already on the cake/cupcakes you could probably leave it at cool room temperature for one day. If you’re just storing the frosting, I would recommend refrigerating it and bringing it to room temp before using it. I’m gonna start by saying this frosting is delicious, but I have one remark. I may not understand much about serving sizes, but when I read this can frost a single layer 9-inch cake, My first thought was “OH! If my cake recipe is two layers, I should double the recipe!” I now have a ton of leftover frosting with no idea what to do with it. There have been worse problems in the history of the world, but I think based on how much I have left over, the original portion would probably adequately cover a 2-layer cake as well. Will the strawberry flavor be more pronounced after the frosting sits a bit? I can’t really taste the strawberry, just powdered sugar and a little butter. The strawberry flavor might increase a touch, but probably not much. A big part of the strawberry flavor is going to come from how sweet and flavorful your fresh strawberries are. Since strawberries are not in season right now, the strawberries that are available tend to be less sweet and flavorful than ripe spring/summer strawberries. This will definitely result in a less flavorful frosting. You can try increasing the strawberry jam by a little bit. When you say powdered sugar do you mean confectioners sugar or granulated? Confectioners sugar. Granulated would be too grainy. Enjoy! 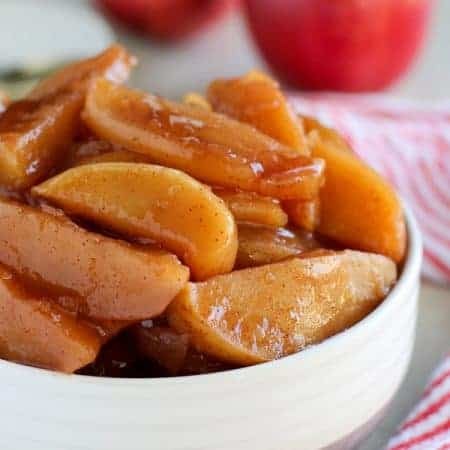 Can I use just strawberry jam instead of the puree. Sure, it will just be a bit more sweet. Enjoy! 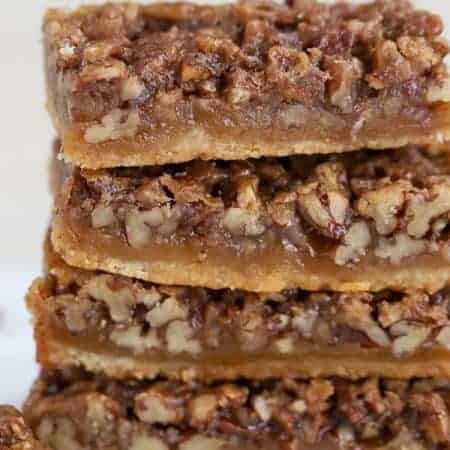 I’m super excited to try this recipe this weekend! It looks incredible! Can I substitute in the jam for the puree and freeze dried strawberries? If so, what measurement would that leave the jam at? Thanks! Hi, Lizzi. You’ll need quite a bit of jam since that will be the only thing adding the strawberry flavor. I’d say probably close to 1/4 cup. The jam will add a fair amount of sugar which will make the frosting much sweeter. Also, the strawberry flavor will be less strong and the color lighter than pictured. Best of luck playing around with it.